Tiger Barbs belong to the Cyprinidae family of fish and their scientific name is Purntius Tetrazona. They originally come from South-East Asia, but can now be found all over the world. Their natural habitat would be a shallow fast moving stream. As with many popular fish you can now get this fish in a range of colours. Popular varieties include albino, green and gold. 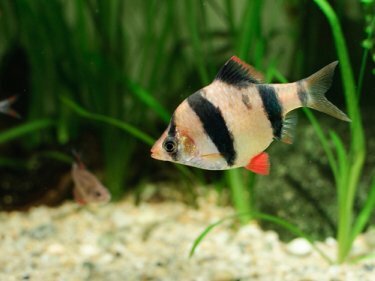 These fish can grow to a max of 3 inches, although they tend to grow much smaller in the aquarium. They are shoaling fish, so they will need plenty of space to swim around. However, like most fish they appreciate some plants and some hiding places. Ideally you keep them in a group of around 10 or more and do this you will need an aquarium of around 100 litres plus. They are not fussy regarding pH, but ideally it should be kept between 6 and 7 pH. They like their water a bit on the warm side, between 23 and 26 C.
They will eat flake food, supplement with live food if you want to breed your barbs. Barbs are also like lettuce. If you choose to feed you fish fresh vegetables, make sure you remove any which is not eaten, as it will start to rot quickly. These fish are known as aggressive fin nippers. Although some fish keepers believe this reputation is unfounded. The bad behaviour seems to occur when they are kept in groups of five or less. When kept in big groups they seem pretty happy to chase each around all day. I still would not suggest putting anything with long fins in with them, such as Siamese fighting fish or guppies. Long fins are just too tempting to them. They are egg layers and are known as being fairly easy to breed. They are normally ready to breed at around eight weeks old. Females are larger than the males and they also have round bellies. They will lay their eggs in the community aquarium, but this can cause problems if you wish to raise the fry. 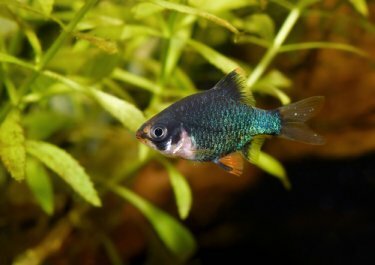 It is a better idea to move the group to a different tank when you want to breed. Wait for them to lay the eggs and then remove the adults. They will eat eggs, even their own. Fry will normally hatch after five days. When they hatch, feed them brine shrimp, if possible, or alternatively liquid fry food.